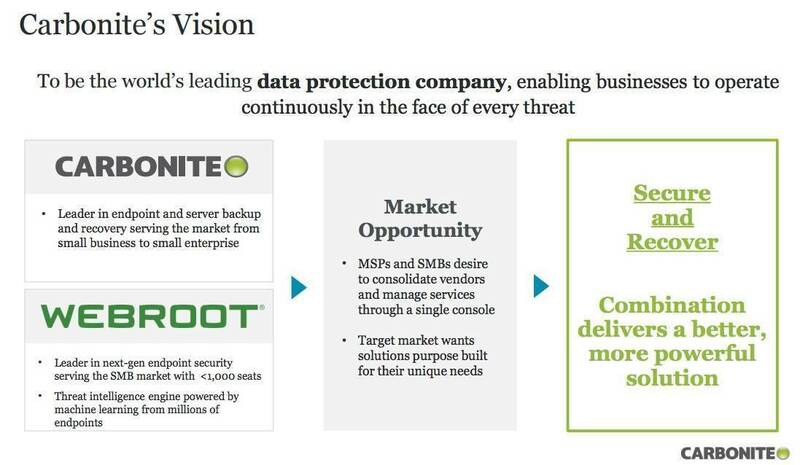 Cloudy backup concern Carbonite has announced a US$618.5m acquisition of endpoint security company Webroot. The strategic intent of the deal is to create a company that melds backup and security and which offers both managed service providers and small to medium businesses the chance to manage both from one console. A slide from Carbonite's investor presentation. All of which sounds great. Until you read recent history. When Symantec bought Veritas in 2004, it did so because it wanted to blend backup and security. The two companies never really integrated their wares well and the deal ended with the 2015 sale of Veritas. EMC hoped that buying RSA and other security companies would let it bring security and storage closer together, with little success. EMC was of course acquired by Dell, which spun out SonicWall and is now rumoured to be offloading SecureWorks. CA Inc is another that tried to offer integrated security and data management, with limited success. So while the idea of storage-plus-security has obviously sounded great for years, delivering it has proven hard. Carbonite nonetheless thinks it can pull off the trick, in part because it thinks its channel and Webroot’s are nicely complementary. But there’s still a stack of development to do before the vision becomes a reality. And we all know just how many risks that can pose, especially once a team confronts the realty of just what’s in the other team’s code! The two companies have erected a microsite on which they detail the deal and offer documentation about what happens next, and when. As Webroot is a private company, the deal is expected to close during Q1 2019.